If you know me or have been following me on Instagram, you know I’m all about putting some #greenshit on my plate. I’ve always eaten and loved vegetables but making the point to add them to each one of my meals was honestly was such game-changer for my nutrition. This one habit changed so many aspects of my eating and views on food. It helped me realize I could literally eat what I considered healthy meals anytime and anyplace. It didn’t matter if I was at a barbeque joint in Memphis, at a friend’s a wedding or on vacation at Disney, I learned could still eat healthily and be happy with my choices as long as I added some veggies on my plate. It made eating in these situations way less stressful and shifted my mindset more positively about eating and food. It taught me the importance of consistency and letting go of having to be perfect with my meals all the time. If I did fall off, getting back on track became much easier because it’s the one thing I do regardless of the situation or where I am in life. It’s become so ingrained in my daily life, making healthy food choices has become essentially automatic for me. I can almost promise that if you integrate what I’m about to cover now into your daily life, your eating habits will substantially improve, you’ll have more energy, and you’ll feel much better mentally about the food choices you’re making on a daily basis. Without getting too complicated, let’s just keep it basic and define a vegetable as part of a plant that you can eat. Some parts of plants we consider vegetables are scientifically fruits like tomato, cucumber or squash, but for the purpose of eating, let’s consider them vegetables. Some plants I consider carbs nutritionally and I’ll talk about that later in this series. Later in this article, I’ll share a resource that will help guide you on the various vegetable options. 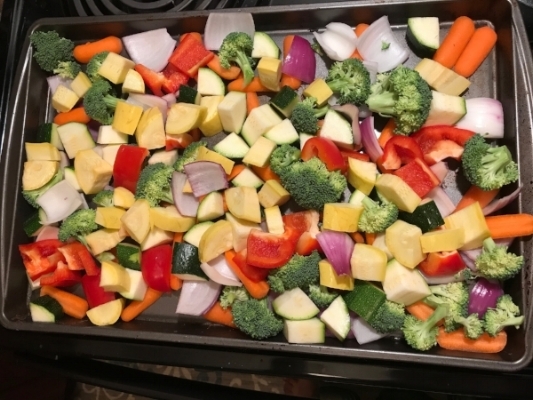 Most of us know we should be eating more vegetables and that they are healthy for us so I’m only going to briefly cover the health reasons so I can devote more of this article towards how they can help you lose weight and fat and how to get more of them into your eating. Veggies are rich in micronutrients. Micronutrients are essential vitamins and minerals that your body needs to function properly in small amounts (“micro” means small). On any day, your body needs several different micronutrients in the right amounts to function normally. Here’s a list of all the micronutrients your body needs each day if you're curious. In our society, our eating typically consists of heavily processed foods or we constantly restrict calories through dieting. As a result, we chronically reduce our ability to get enough of many of these nutrients. Prolonged deficiency in any of these micronutrients can lead to poor health and are associated with an increased risk of disease. In athletes, nutrient deficiencies can also negatively affect performance. You can’t expect your body to go into beast mode if it’s not getting its basic needs. Good news: even though nutrient deficiency is super common, many deficiencies are largely preventable with help from eating a variety of veggies. All plants naturally produce chemicals. Some are good for us, some are toxic. In the plants we tend to eat, many of these chemicals are beneficial to our health. Theses phytonutrients and antioxidants can protect us from certain conditions like cancer and “diseases of abundance” like type 2 diabetes, heart disease, high blood pressure and obesity. Much of the solid material plants are made of are difficult to digest without help from the bacteria that live in our intestines and feed on this material. This indigestible material is generally called fiber and is essential for maintaining a happy, healthy digestive system that’s able to break down and absorb nutrients from the things you eat. Fiber is also necessary to keep you pooping like a champ and prevent certain diseases as well. Plants also contain lots of water. Did you know a cucumber is 95% water? Just ask this guy. Other veggies that are also really high in water are tomato, zucchini, celery, and lettuce to name a few. Most of us could stand to drink more water, but guzzling down tons of water or looking like a complete meatstick gym rat carrying around a gallon jug of water is not something most of us want to do. You’ll still need to drink water, but eating more veggies can make it easier to stay more hydrated. To lose body fat and weight, you need to be in an energy deficit which means you take in less energy from food (calories) than your body needs on a daily basis. We could do that by counting and tracking all the calories or by making some small changes to your meals like adding vegetables to your plate or replacing higher calorie foods with vegetables. Vegetables are typically bulky and take up more space on your plate and in your stomach. They are also low in calorie. When you add veggies to your plate and eat them, you’re more likely to fill up on the veggies and eat less of the higher calorie foods, reducing your total calorie intake. For example: Let’s say you love pizza. It’s pizza night and you normally put down two slices. Each of those slices is about 300 calories. Without veggies, you’d definitely eat those two slices eating 600 calories. However, let’s say if you added a side salad with a drizzle of Italian dressing totaling 80 calories. When you eat the salad with the pizza, you’re full when you only eat 1 slice of pizza. Add some veggies to your treat meals next time! Now you’ve only eaten 380 calories. You automatically cut 220 calories from your day without really having to give up pizza. BOOM! You could also replace foods on your plate with a veggie and reduce calories. For example: if you ate 1 cup of mash potatoes (about 215 calories), you could replace that with 1 cup of mashed cauliflower (107 calories) and automatically reduce calories by half. Lastly, because veggies are so bulky, they can help you feel fuller for longer which means you’re less likely to be hungry after eating. This keeps you from unnecessarily reaching for more food throughout the day or because you still feel hungry. Pro tip: If fat loss is your goal, eat the veggies on your plate first to start filling up on those before moving onto higher calorie foods like proteins and starches. Putting those veggies on your plate with each meal isn’t just about losing weight and getting healthier. The simple act of doing something each day no matter what builds consistency, stability and a sense of accomplishment to your daily life. Remember the viral video where the U.S. Navy Admiral gave a speech about the importance of making your bed? The point wasn’t just about making your bed but to do one simple thing each day that you know you should do. This one simple act sets off a feeling of pride and accomplishment that carries over to other things you do. In this sense, it’s the same as adding veggies to your meals. You get into the habit of doing something you know is good for you. This can spill over to other aspects of your life until you’re doing tons of things that are healthy for you and moving you towards your goals. Plus, adding a vegetable is automatically a better choice and makes the meal healthier. Remember pizza night? Add some veggies to meals that you may normally consider “bad” and you’ll likely feel much better mentally about the choice when the meal is less than ideal. Now that you understand some of the many benefits of getting more vegetables, let’s see how to add more to your daily meals. Roughly figure out how many servings of vegetables you’re getting now. We’ll call a serving about 1 cup with a measuring cup or about the size of your fist, or a small handful. Go ahead and make a fist. See what that looks like? That's what you'll call a serving. It also works if you take one hand and make a cup. Whatever tool or size you use just be consistent and do the same thing. If you’re eating no vegetables, try taking a baby step and getting one serving a day. If you can do more, go for it. Just keep in mind to do what you can do consistently. Gradually over time, you can work up to eating a serving of veggies at each or most of your meals and snacks. ROY G. BIV that plate! I preach putting some green on your plate, but vegetables come in all colors of the rainbow. Different color vegetables contain different micronutrients, antioxidants, and phytonutrients. By getting a variety of colors in your day, you can ensure you’re getting all the things your body needs to stay healthy. Shoot for all different color veggies. I suggest you try a new vegetable each week or at least every month. You may not like the taste of some, but you may find some you love. In the process, you’ll find foods that may or may not work for you. Then, you can start building your own go-to list of vegetables. Here’s a list of vegetables divided by color that I often reference. Depending on how they’re prepared or cooked, veggies can taste different, change texture, unlock different nutrients, or increase the availability of existing nutrients. For example, cooking tomatoes like in a pasta sauce can increase the amount certain nutrients that may prevent certain types of cancer (Source). I could care less what some hippy-health guru that drinks dirt water said on Instagram about preparing or cooking vegetables a certain way to make sure you get all the nutrients. If you won’t eat them because they taste like an old foot to you when they’re prepared that way, then it’s just not going to work for you. I suggest trying different ways to prepare your veggies. Try some raw in a salad, throw them on the grill, sauté them, make a stir-fry, or roast them in the oven, and etc. Season them how you want and pair them with different foods to bring out or enhance flavors so things don’t get boring. Try new flavors and flavor combinations as often as you're willing. If you need help finding ideas for veggie dishes, Pinterest is your friend. Just type in whatever vegetable you want to cook and add “recipes”. You can get more specific as you want with more search terms like "grilled", "curried", and etc. Fresh, locally-sourced organic veggies are great but they aren’t always the most available. If you can get fresh veggies from a local farmer’s market, go for it. If not, don’t let that stop you. Just get some veggies period! Worry about details like that when you’ve got the basics down. If you’re short on time to prepare, shop for pre-cut veggies at the supermarket so you spend less time chopping and prepping. It’s more costly but will save you a lot of time each week. Fresh veggies will spoil if you don’t eat them. If you're trying to eat healthy on a budget, opt for frozen veggies to reduce waste. Frozen steamer packs of Brussel sprouts and broccoli are a staple item in my freezer and I don’t have to worry about them going bad if I don’t cook them right away. Some folks just don’t like the taste and texture of either all veggies or certain ones. If you are one of these people, there’s still hope for you. You’re going to need to get creative and sneaky if you want to get more green things in your life. Make soups, stews, chilis or sauces with veggies to hide the taste and texture of veggies. Bury them in bakes, casseroles or frittatas. This will make a great way to get them at breakfast and if you mince the veggies small enough, you’ll barely notice their presence. Bake them into treats or loaves of bread. Pumpkin, carrot, and zucchini do especially well in baked goods. Again, Pinterest is your best friend. Search “healthy sneaky vegetable recipes” for some ideas. Veggies are rich in nutrients that benefit your health, wellness, and performance. Try to get veggies on your plate anytime you eat! Choose vegetables that are convenient and prepare them how you like. Try new veggies, recipes, and methods of preparation to learn which foods and cooking methods work best for your taste and life. Audit your eating right now. What do some of your plates look like currently? How will you use these tips to add more veggies to your day? Let's see if you can add vegetables to just one more serving or meal per day than you already are and keep that up for a week. Next, check out Part 2 of my Basic As F*ck Eating Habit Series here.